Super Blue Tire Shine is a fast drying, high gloss, long lasting solvent based tire shine. This tire shine is easy to apply and will draw attention to your tires making your car look its best. Super Blue will outlast any other tire shine on the professional market. Super Blue is a concentrated tire shine that will repel water and add that extra protection to your tires. Black & White Tire Cleaner is a heavy duty bleach tire cleaner that attacks dirt and grime that has developed on the tire. This powerful tire cleaner cleans tires, white lettering and whitewall tires easily. There is no match for Black & White Tire Cleaner, it's that strong. 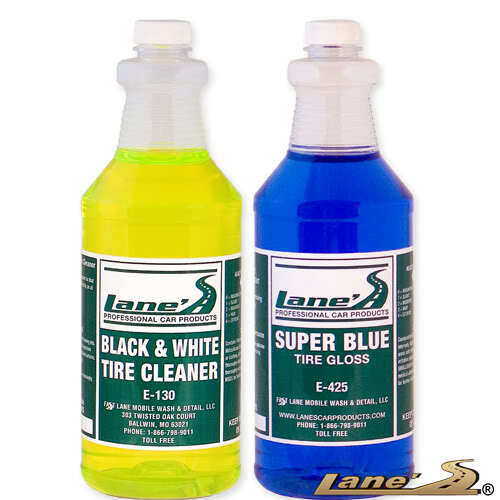 To protect your tires, Lane recommends cleaning your tires thoroughly with Black and White Tire Cleaner and then use our most popular Super Blue Tire Gloss to prevent tire cracking and discoloration.